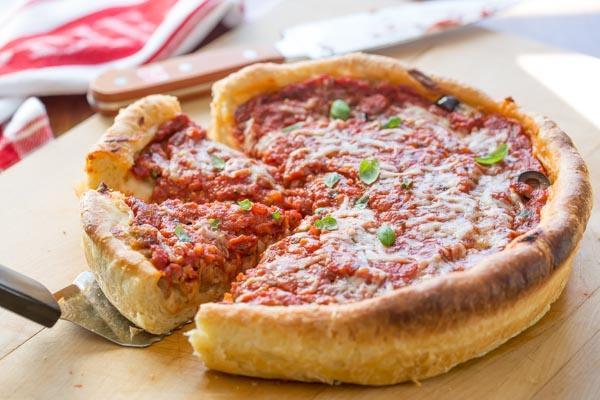 No need to travel all the way to Chicago for this incredible Chicago Style Deep Dish Pizza recipe, when you can make it at home! 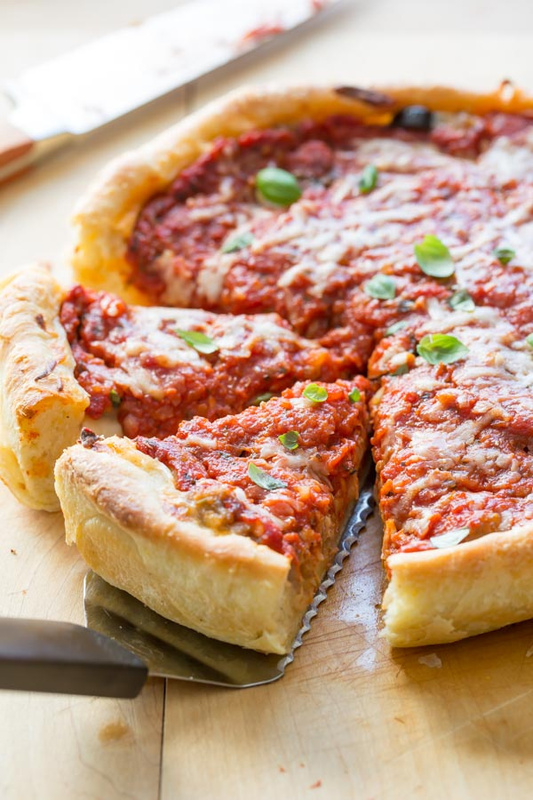 Try this easy, detailed deep dish pizza with step-by-step directions for a thick and buttery, flaky crust and a rich, chunky tomato sauce, with plenty of gooey cheese. This deep dish pizza recipe makes enough dough and sauce for two 9-inch pizzas. I baked one pizza in a 9-inch cast iron skillet and the other in a 9-inch cake pan. Both came out beautifully but just a little different. The cast iron yielded a slightly crispier crust while the cake pan produced a softer, chewier crust. Both are fantastic and hold up extremely well under the thick layer of toppings. If you allow the pizza to rest for 20 to 30 minutes before serving, it can easily be removed to a cutting board for slicing. This extra time to rest and cool ensures the toppings and cheese won’t spill out onto your plate. Not saying that’s a bad thing, in fact it’s super appealing to me! 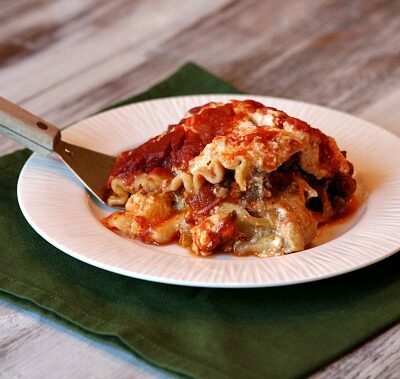 But if you don’t want to eat this deep dish pizza recipe with a fork, let it cool a while before enjoying. Pizza is easily customizable to all your favorite toppings. We served this Chicago Style Deep Dish pizza recipe with big chunks of sweet Italian sausage and a few chopped kalamata olives. Since this recipe makes two pizzas, you can top each with different family favorites. Check the Notes section of the recipe for more delicious topping ideas. And please don’t let the long list of detailed instructions scare you off. This pizza dough and sauce recipes are easy to make and worth every single minute in the kitchen. Once a month our adult children, their spouses and our grandchildren come over for Sunday supper. 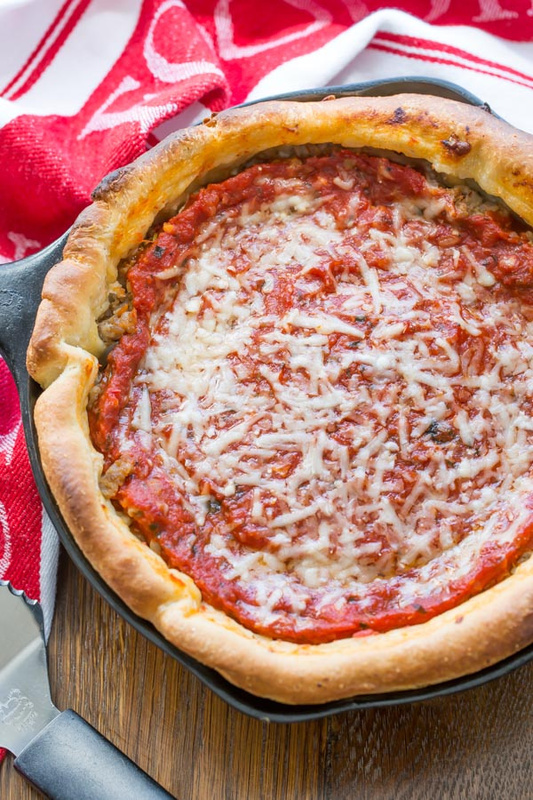 This Chicago Style Deep Dish pizza recipe is on the menu for our next family gathering. I’m going to double the recipe and let the whole family help by adding their favorite toppings. Such a fun way to enjoy family time and America’s favorite food! 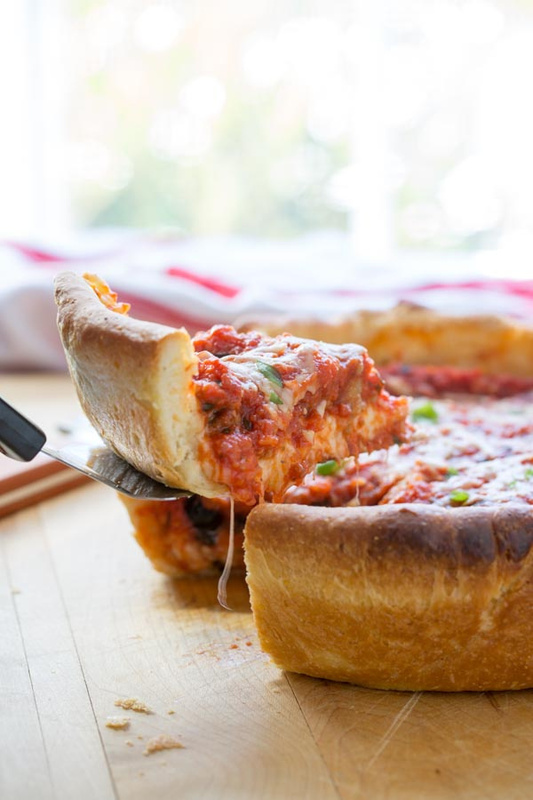 Here's a Chicago Style Deep Dish Pizza recipe you can make at home. 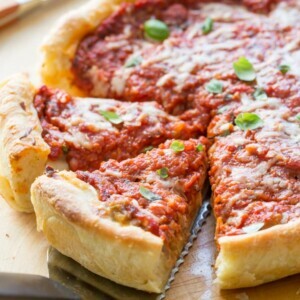 Try this easy, detailed recipe with step-by-step directions for a thick and buttery, flaky crust and a rich, chunky tomato sauce, with plenty of gooey cheese. Using a stand mixer fitted with a dough hook, combine the flour, cornmeal, yeast, sugar, salt on low speed until blended. Add the water and melted butter. Mix until combined, about 1 to 2 minutes. Scrape down the sides of the bowl and mix again until well blended. Increase speed to medium and knead until the dough is shiny and smooth and pulls away from the sides of the bowl, about 4 to 5 minutes. Coat the sides and bottom of a large mixing bowl with 1 teaspoon of olive oil. Transfer the pizza dough to the clean, oiled bowl and turn to coat. Cover with plastic wrap and let the dough rest at room temperature until nearly doubled in size, about 1 hour. While the dough rises, prepare the pizza sauce. 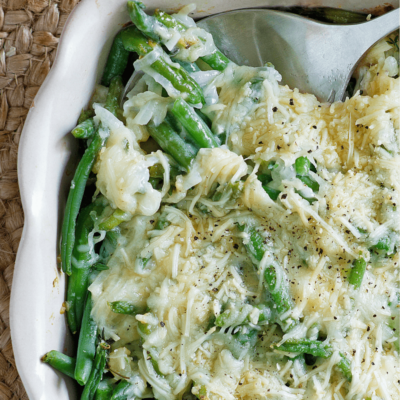 In a medium saucepan over medium heat, combine the 1 tablespoon of olive oil and 1 tablespoon butter. Add the minced onion crushed red pepper, Italian seasoning, salt and pepper. Cook, stirring frequently until the onion is softened, about 5 minutes. Add the garlic and cook until fragrant, about 30 seconds. Add the tomatoes and sugar and bring to a simmer. Reduce the heat to medium-low and cook, stirring frequently, until the sauce has reduced to about 2 1/2 cups, about 30 minutes. Remove from the heat and add the fresh basil and olive oil. Check the seasoning and add salt if needed. Cover and set aside. Adjust the oven rack to the lowest position and preheat oven to 425 degrees. Turn the dough out onto a clean countertop. Roll the dough into a 15 by 12-inch rectangle. Using an off-set spatula, spread the softened butter over the dough leaving a 1/2-inch border along the edges. Starting at the short end, tightly roll the dough into a cyclinder. With the seam-side down, flatten the dough into a 18 by 4-inch rectangle. Cut the rectangle in half crosswise. Working with one half at a time, fold the dough into thirds like a business letter. Pinch the seams together to form a ball. Repeat with the remaining dough and transfer the balls to the oiled bowl. Cover tightly with plastic wrap and let rise in the refrigerator until nearly double in size, 45 to 50 minutes. While the dough rising, cook the Italian sausage in a large non-stick skillet. Break the sausage up into chunks and sauté until cooked through. Drain well and set aside. Coat two 9-inch cast iron skillets or cake pans with 2 tablespoons of olive oil each. On a clean countertop, roll one of the dough balls into a 13-inch round disk about 1/4-inch thick. Roll the dough loosely around the rolling pin and transfer to the prepared skillet. Unroll the dough and lightly press into the pan, making sure you work it into the corners and 1-inch up the sides. If the dough resists, allow it to rest for 5 minutes before trying again. Repeat with the remaining dough ball. Sprinkle each pizza with 2 cups of the shredded mozzarella. Divide the sauce between the two pizzas, spreading with the back of a spoon until evenly distributed over the cheese layer. Divide the cooked Italian sausage between the two pizzas, scattering to cover the sauce. Top with the olives, then the Parmesan cheese. Bake until the crust is golden brown, about 20 to 30 minutes. If over-browning, tent the pizza with foil until cooked through. Remove the pizza from the oven and cool for 10-minutes before serving. 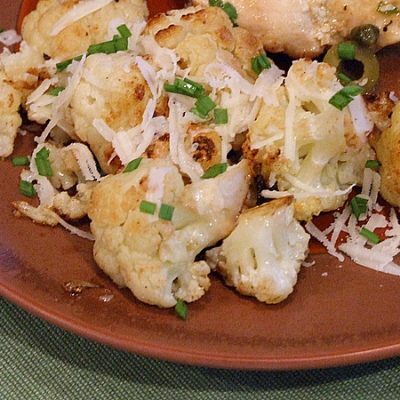 TIP: I would start making this recipe about 2 1/2 to 3 hours before you want it on the table. The sauce and toppings are easily made ahead and refrigerated until needed, and that would cut some time. Optional add-ins: Feel free to omit the Italian sausage and olives in this recipe, if preferred, and prepare the best plain cheese pizza you've ever had! Great recipe! It does take awhile to make, so I made a double batch. The pizza dough is fantastic. 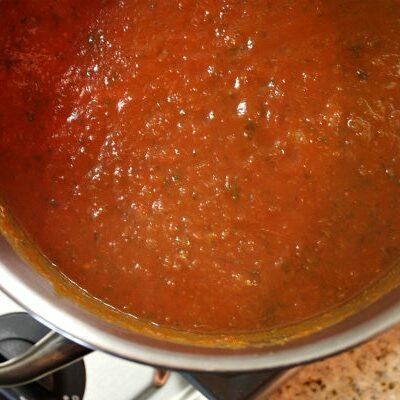 I used the sauce recipe (had another tried and true one for the dough) and the family loved this sauce. Easy to make and so very yummy! The sauce goes on first in this recipe, but it’s pretty substantial… so the toppings just kind of sink into it while baking. I need more clarity with the instructions. The ingredients had several listings of butter, oil, etc. It was not clear to me when to use what. How would you freeze this? Can mail order Lou’s pizza frozen and then bake in oven. Should pizza be partially baked before freezing? 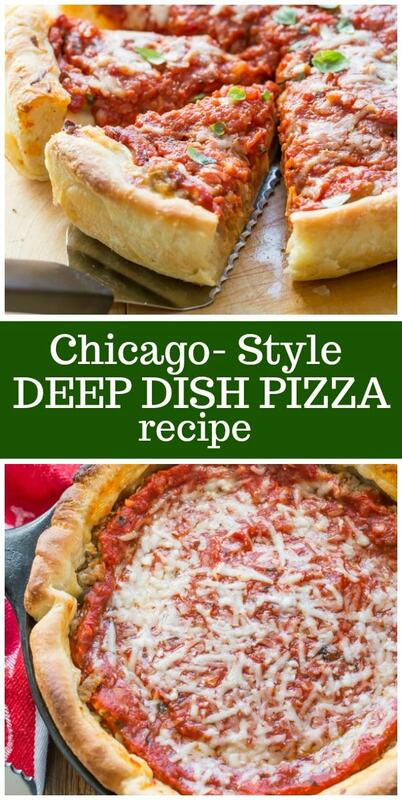 thank you for this, I’m nowhere near Chicago, so not many deep dish options, but love the idea of making it, had always thought this best left to professionals with big pizza ovens, so glad you’ve put this recipe together! Pizza is my fav!! But I am pretty lazy when it comes to cooking. But I think I am gonna make this recipe coz its sooo tempting!! I love deep dish style pizza and this one looks and sounds amazing!